Please put Verizon on the list. It’s a hideous eyesore. Absolutely, without a question, Verizon. A crime against design. HALLMARK! That scripty font makes me nauseous. Kmart can just be renamed zombieland. Sherwin-Williams!! It looks like they’re PRO-pollution of the environment as long as it’s done with their paint. Let’s go with Sherwin-Williams. As a design-related product there is no excuse. I gotta go with Sherwin Williams. Cover the earth…in paint?!? That’s healthy. Sherwin-Williams. In an age of oil spills, coating the earth with goop is a pretty ominous brand. 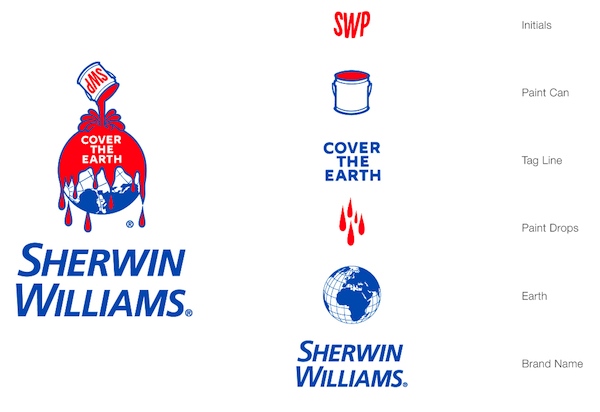 The Sherwin-Williams logo definitely needs an overhaul?cover the earth tag needs a re-fresh too! Sherwin Williams’ is absolutely awful. Redesign the Sherwin-WIlliams logo. It’s so dated! Ask for a redesign and you shall receive. So we got busy developing platforms, creating concepts, and identifying areas of opportunity to improve upon the current Sherwin-Williams logo. And how could we forget the ominous “Cover the Earth” tagline? Then we asked ourselves: Should we keep any, or all, of the current brand assets? Which ones should we evolve or revolutionize? What are the positives and negatives associated with each element? We juxtaposed these assets on top of the company’s mission statement?which appears right on their website’s homepage?to see if there was an appreciable degree of harmony between the them. a) They’re relying on more than a hundred years worth of experience, an iconic status, and a pole position in the North American market. b) Sherwin-Williams paints are sold ONLY in Sherwin-Williams stores and nowhere else. This means that if you walk into a Sherwin-Williams retail store, you can be absolutely certain that whoever you talk to will know everything there is to know about their products. Even though almost all of their nearly 4,000 retail stores are in the US, Sherwin-Williams products are readily available anywhere in the world (except, curiously, in most of Europe and all of Africa). This would also explain why arguably the most prominent feature of their logo is the Earth. This speaks again to expertise, versatility, and a vast array of products. 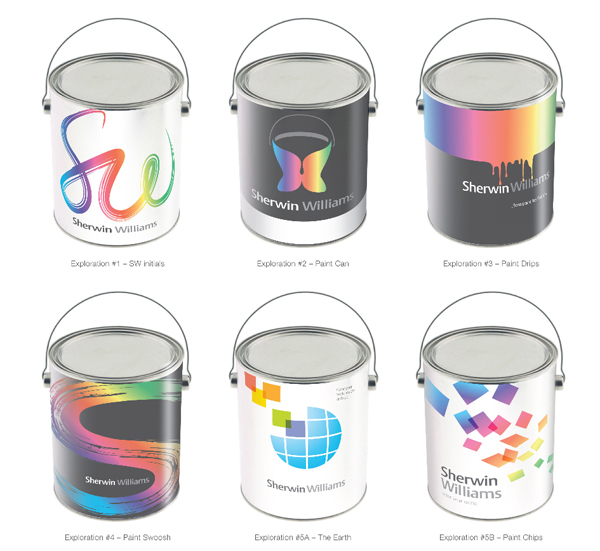 Basically, what they’re saying is, “No matter what you need to do that involves paint, Sherwin-Williams has something to help you achieve your goals.” That would explain the can and the pouring paint elements of the logo. This is standard corporate boilerplate, but this is also where the mission statement’s connection with the identity completely falls apart, as you would NEVER associate “innovative” with the current, 150-year-old logo. And as many of you pointed out, the combination of the four key elements (initials, paint can, pour/drip and globe) strongly telegraphs negative connotations of heaviness, messiness, and pollution all wrapped in a hopeless and antiquated design. And the “Cover the Earth” tagline doesn’t help matters one bit either. But Sherwin-Williams is THE preeminent paint brand in America after all; far be it for us to suggest simply tossing out an iconic logo and starting from scratch. So what could we do to better reflect today’s design sensibilities and make Sherwin-Williams more relevant to today’s marketplace? To arrive at our design, we listened to your feedback and explored a few different directions that emphasized a more inspirational and approachable perspective on paint while preserving the positive aspects of the current logo. An obvious starting point in evolving the current logo was to reinterpret the SWP initials as a signature written in paint. We then looked at the paint can. Since painting is, after all, is a creative exercise that ideally yields beautiful results, in this version we put a unique spin on the quintessential embodiment of beauty: a butterfly. This direction substitutes the ecologically unsound toxic paint drips in the current logo with a more positive interpretation of the act of painting. The Jackson Pollock-like drips help reinforce the notion that painting is fun, liberating, and creative. Swoosh showcases “the hand at work,” and represents the personalization that is inherent in the act of painting. The visual of the Earth made up of paint chips speaks to the fact that Sherman-Williams products can be found around the world, as well as the empowerment that comes with having all these colors at your fingertips. We believe that this new Sherwin Williams logo captures the positive aspects of painting?the freedom of expression, the sense of discovery and transformation, the personal and inspirational natures of painting, the act of creating, the lightness and brightness, and the empowerment of the painter?while removing, or at least de-emphasizing the messiness, imprecision, and anachronistic nature of the current logo.
? We kept the Earth to speak to comprehensive and expert service, but removed the allusion to continents to give it more contemporary, boundary-less, aspirational feeling.
? We kept the longitudinal and latitudinal lines in a more abstract way, in turn creating a world made up of paint chips and making it a more relevant visual tie-in with how customers shop for paint. These white lines also lend a lightness to the overall look of the logo. ‘ We added ?emanating’ paint chips to connote a sense of creative energy, empowerment, and excitement that comes with choosing a color and painting a room, as well as having the logo speak to the myriad possibilities that quality paint affords you.
? By showing the spectrum of color, we are referencing customers’ palette options and their unique experience when choosing paint, bringing the paint experience back to the individual. We also felt this new logo was a strong complement to the wonderfully artistic and dynamic ads the company has been running on television for the past several months?ads that have been very well received by consumers (just type in “Sherwin Williams commercial” on Twitter and see for yourself). The use of paint chips, the empowerment and freedom conveyed by the act of creation, the idea of creating your world?it’s all present in these 60-second spots. Last but not least, we also threw in a new tagline, “Color Your World.” In this day of oil spills, global warming and pollution, that’s a whole lot more positive, personal, and inspiring than “Cover the Earth,” donchya think? So now that we’ve lifted the drop cloth and unveiled our thoughts for a new logo, what do you think: Is it a “stroke” of genius, or should it be “canned?” And go gentle on us, boys and girls?it’s always easier to give (criticism) than to receive!